on Saturday, September 25, 2010.
it's a benefit for the Bay Area Women's & Children's Center in the Tenderloin, SF. Music courtesy of DJs Bardot & Michael Charming! - Get a Derby kit and create your own race car to race on a track in the gallery against other participants! - Get Derby kit and create your own art car masterpiece to display in the gallery! - Donate a piece of car culture-themed art to be a part of the silent auction for charity! - OR just come and check out the fun! Free to spectators!! 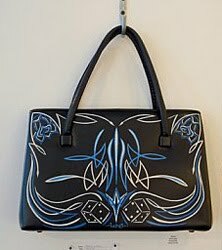 Here's an amazing pinstriped handbag auctioned off in previous years.